The national UK Schools Chess Challenge, sponsored by Delancey, reached its second stage today. 67 children from a number of Suffolk schools who qualified from their local competitions, gathered at Woodbridge School for the Suffolk Megafinal. Entrants needed to score four points (out of six) to guarantee qualification for the third stage, the Gigafinal, which takes place on 11/12 July in Manchester. It was also possible to qualify by being the highest scorer (both boy and girl) in each age-group. 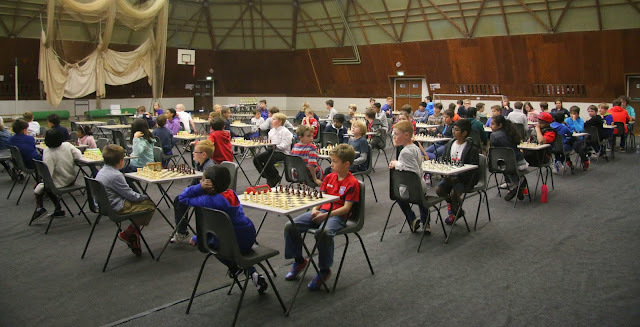 Three players scored the maximum six points: Arthur Nath (under 8B) - Meadows Montessori, Ipswich; Adam John (under 9B) - Bury Knights; Anita Somton (under 11G) - Bury Knights. Arthur Nath has an excellent pedigree - he is former Suffolk Ladies' Champion Vicky Allen's grandson! Eleven of the above Supremos and Supremas are from the Bury Knights or the Bury St Edmunds club. Good luck to all the above, as well as the other qualifiers, at the Gigafinal.